Dr. Tobi Baldwin received her Bachelor of Science in Honors Kinesiology from the University of Western Ontario in London, Ontario, Canada. While at the University of Western Ontario, she was a student athletic trainer for the hockey team which led to her interest in pursuing a career in physical therapy. She attended the University of St. Augustine for her physical therapy degree. In 2018, Dr. Baldwin received the Distinguished Alumni Award from the University of St. Augustine. Her primary area of clinical practice is outpatient orthopedics. She completed a fellowship in orthopedic manual physical therapy through USAHS. She was fortunate to be mentored by Stanley Paris and Catherine Patla. She has been a faculty member at USAHS since completion of the fellowship in 2004. Dr. Baldwin has travelled nationally and internationally to teach for the University. Dr. Baldwin is an active member of the American Physical Therapy Association, the American Academy of Orthopedic Manual Physical Therapists and the American Council of Academic Physical Therapy. She has served on various committees and task forces including a task force to identify the best methods of promoting and teaching clinical reasoning to entry-level physical therapy students. 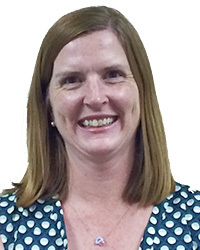 Dr. Baldwin is an Assistant Professor and the Assistant Program Director for the University of St. Augustine for Health Sciences DPT program.